Automatic call handling (or Auto Attendant) is a way to route inbound calls to your business. Use auto attendant to let your callers interact with the automated voice menus you define, and self-direct the calls without requiring any manual operator or receptionist. You can plan what you want your callers to experience when they call your company, define schedules and rules, and set up professional greetings for your business. 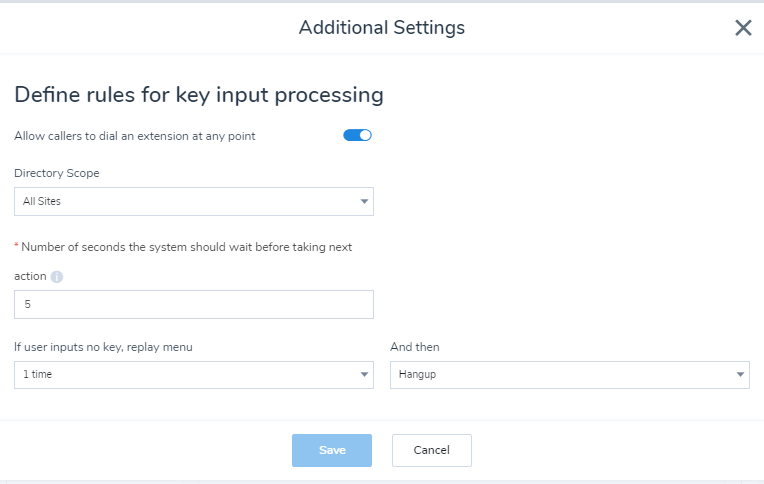 We recommend that you set up users, ring groups, and call queues before setting up your auto attendant. Look more professional: Auto attendants make your company look more professional. Replace the receptionist: It replaces the need for a receptionist and saves you money. Route calls efficiently: It connects your callers to the right resource quickly and efficiently. Customize for different hours: You can play different menus for business hours versus after-hours. Creating your greetings is easy: You can record your own and upload them, or upload customized prerecorded greetings. You can even use the 8x8 Audio Production Store for professionally recorded greetings that enhance your image. Shared schedule: Update your business hours centrally, and use the hours across multiple auto attendants. The business hours schedule is automatically adjusted for the time zone of the auto attendant. Audio prompts: Manage your auto attendant’s audio prompts centrally. Text-To-Speech prompt: Create Text-To-Speech (TTS) prompts using over 50 languages. Simplified menus: Take advantage of the simplified open, closed, and holiday menus. Lunch schedules: Define lunch hours for any working day. Exception schedules: Define exceptions for any changes in your regular business hours. Holiday menu: Prepare an alternative prompt for holidays with shortened or closed business hours. Alternate menu: Prepare an alternative prompt during an emergency that prevents you from operating during your regular hours. Test menu: Test your auto attendant and enter a valid phone number to call, listen, and interact with the menu. You must log in as a user to run the test, and have Virtual Office services assigned to the user profile you log in to. Call direction: Direct callers to ring groups, call queues, voicemail, and even additional auto attendants. Ability to clone: Clone an existing auto attendant and edit the site or language information, select a phone number, and get them going quickly. Auto attendant's caller ID does not appear correctly. Small Office: Set up your auto attendant to back up your live receptionist. Store Front: Use ring groups to make all phones ring at once, and set up group voicemails. Start Up: Use an auto attendant and ring groups to make your company look bigger. Multiple Languages: Use an auto attendant to set up sub-menus for multiple languages or businesses. Identify the calls you want to go to the auto attendant. Should all inbound calls go through the auto attendant, or just those that your live receptionist can’t answer? Is the time of day important? Identify the business hours, holidays, and any exceptions. Is it a 24/7 business, or is there a custom schedule? Create a schedule. How do you like to treat calls during closed hours, and on holidays and corporate events? What menu options do callers have? Does one menu work, or do you need sub-menus? Determine where to route calls. Should they go to a person, a group, or a cell phone? What happens when calls aren't answered? With auto attendant, you can route a call to a call queue, an extension, an external number, or a ring group. Create the desired call queues and ring groups, and set up individual extensions. Check out some tips about writing your auto attendant script(s). Write down your voice menu script. Do you need support for multiple languages? For example: "Thank you for calling Specialty Cookies. If you know your party’s extension, you may dial the number at any time. To check on the status of an order, press 1. To talk to our Sales department, press 2. For Shipping, press 3. To access our contact directory, press 8. To hear this menu again, press 9. For operator assistance, press 0." Check out some tips for recording your auto attendant menu. Your auto attendant is tied to your business schedule, and is activated during the business hours. Let's say your business operates five days a week from 9 AM to 5 PM, and you are closed on Saturdays and Sundays. You must define a schedule with these business hours, and create your call routing choices in the auto attendant. From the main menu, go to Auto Attendants > Schedules > + Create Schedule. You can define your schedule independent of the time zone, and share the common business hours schedule across auto attendants in different time zones. Each auto attendant automatically applies the time zone it is associated with. Hours outside of open hours are automatically treated as closed hours. Click next to any open day to add lunch hours. In Edit business hours, define the Open hours before the first lunch. Click + to add a lunch status. Select Lunch in the drop-down list and select the time. Add as many lunch and open hours as your business allows. You can also add multiple open hours in a day like a restaurant business that is open for lunch and again for dinner. You can define a call routing option during the lunch hour. For example, a doctor's office can announce to the callers that the office is closed for lunch from 1-2 pm, Monday - Friday, but callers can leave a message for the receptionist at any time, or call 555-555-5555 in the case of emergency. While editing Schedules, open Exceptions to weekday schedule. Click + Add an exception. Enter the Date and a descriptive Name for the exception. Click to Add business hours, if applicable. Everything outside the business hours is considered as closed. The weekday exception indicates days and hours that your business has a different schedules from your usual business hours. For example, a clothing store has a special sale for 4th of July which is a Wednesday. The store manager needs to define a different open and lunch hours for this day as the business hours are extended for this day. The weekday call flows still applies to the exception weekday hours. While editing schedules, open Holidays exceptions. Click + Add a holiday. Enter the Date and a descriptive Name for the holiday, such as Thanksgiving Day. Holidays defined in this sections overrides the regular weekday schedule. Click to Add business hours, if applicable. Everything outside the business hours is considered as closed. The holidays call flow applies to the dates when business hours need to follow a different schedule and a different call flow. When you are finished, save your changes. The new schedule appears in the list of schedules in auto attendant, and can be shared with other auto attendants. Now that you have created a schedule, you need to configure the call handling menus, including the welcome message and call routing rules. Go to Home > Auto Attendants > + Create Auto Attendant. You can also clone an existing auto attendant and edit the site or language information, select a phone number, and get them going quickly. For details, see our content on Clone Auto Attendants. Enter a Name for your auto attendant. A descriptive name helps you locate a specific auto attendant when more auto attendants are created on your phone system. Select a Site (or location) for your business. The auto attendant automatically inherits the time zone and language specified for the site, unless you specify otherwise. Enter a Phone number and Extension Number. You can use the extension number later to forward calls from call queues or ring groups to this auto attendant. Click to enable Display Auto Attendant in company directory option. The auto attendant name and extension appears in the company directory. Select the Time Zone and Language. The selected time zone applies to your business schedule, which is linked to the auto attendant. The selected language determines the language of text-to-speech prompts, system default prompts, and messages in auto attendant. If you choose a language other than the default selected for the site, you must create and save your audio prompts in the new language; otherwise, no prompt is presented. If you have created a schedule before, it shows up in the list. If you have not created a schedule, you receive a prompt to create one at this point. For network emergency, enable Apply Alternate Menu. Alternate Menu is used to handle unexpected events that require your business to be closed (or open) beyond scheduled hours. Calls are routed based on the options you have defined under alternate menu in Call Handling Menus section. If you disable this option, the calls are routed back to the regular scheduled routing. If your network is running smoothly, this option must be disabled. Set up Call Handling Menus to route the calls. Call Handling Menus allow you to define call routing options when your business is open, closed, on holidays, or in a state of emergency. Call handling menus become available for configuration once you select a site. Use text-to-speech: Type your message such as: "Welcome to AcmeJet's Sales and Support. For Sales, press 1. For support, press 2". Text-to-speech is used to create a computer-generated voice in the language defined in your auto attendant. “Thank you for calling AcmeJets. If you know your partys extension, you may enter it at any time. For Sales, press 1. For Sales, press 1. For support, press 2.” You can also select the default audio file, or delete/replace your custom files. Skip playing prompt: Do not play an audio prompt. Let's say you want to send callers directly to a ring group or call queue during open hours, but direct callers to auto attendant during closed hours; you would choose to play your auto attendant prompt only during closed hours, and skip playing the prompt during open hours. Note: If you choose to skip the audio prompt, voice menu instructions do not play for the caller; you must rely on other methods to inform callers, such as entering the call menu information on your organization's Contact Us web page. Click Edit Setting to set up additional rules for when callers fail to select an option from the call menu. By default the auto attendant menu replays once. Further failure of action from callers results in a dropped call. However, you can edit these settings to edit the number of menu replays and call routing when there is no action by callers. You can also allow callers to dial an extension at any time, define the scope of contact directory whether it is one site or all sites, the number of seconds the system waits after each input, the number of replays, and the final action whether to route the call or hang up. Click +Add key to route the incoming calls. In the Key manager window, select a Key from the drop-down list such as 1-empty. Empty means the key is free and available for use. Select a routing destination from the drop-down list to route your incoming calls, and save. For example, you can choose to add a sub-menu (including prompt and keys), send the call directly to voicemail, repeat the menu for the caller, transfer the call to a user, a service (such as call queue or ring group) , or an external number. You can also let the caller dial the company directory, a name, or an extension at any time. Note: If you have created an Auto-Attendant in another language such as Spanish or Italian, you can select that Auto-Attendant as the target for the service key. Modify your prompt to inform your callers about the language choices. For example, you can write: "Welcome to AcmeJets Inc. For Spanish, dial 1. For Italian, dial 2." The call routing option for key 2 can now point to an Auto Attendant in Italian. Weekdays closed and lunch hours. Holidays open, closed, and lunch hours. Alternate Menu for exceptional events, such as outages or emergencies that prevent your phone system from working properly. See how to create Alternate Menu. Click to Save your call handling menus. Alternate Menu is used to handle unexpected events that require your business to be closed (or open) beyond scheduled hours. You can create an alternative menu and turn it on during emergencies. The incoming calls are routed based on the options you have defined under Call Handling Menus > Alternate Menu. You must turn off the alternate menu to restore call routing back to schedule-based routing. For example, if you have a power outage and cannot assist customers, record and save a purpose-made prompt, such as “We are experiencing a power outage at the moment; please check with us later.” To restore call routing to the regular schedule once the emergency is over, remember to enable the alternate menu during the emergency and disable it once the emergency ends. Go to Home > Auto Attendants. Click to edit an existing auto attendant. In the Call Handling Menus, click to open Alternate > Alternate hours menu. Select a prompt to play and add keys to route the calls. For details, follow the instructions for call handling menus. The incoming calls are routed based on the options you define for the alternate menu. Make sure to disable Apply Alternate Menu once the emergency is over. In Filters, click a site. The auto attendants for that site appear on the page. If you have a lengthy auto attendant menu that must be replicated for multiple offices or in multiple languages, you can clone an existing auto attendant and edit the site or language information, select a phone number, and get them going quickly. Click next to an existing auto attendant, and select Clone. A copy of the existing auto attendant opens. Enter the name and site or location, make the desired changes and save. Why do I need an auto attendant? Auto attendants can serve as backup to a live receptionist, or can facilitate the transfer of calls without the need for a human operator. If you expect high call volume and would like to direct callers using an automated voice menu, use 8x8 auto attendant to set up automatic call handling. In addition, auto attendants allow you to easily switch between modes of operation during standard business hours, holidays, and emergencies. How do I support multiple languages in my auto attendant? You can select a language different from your site language in auto attendant. The selected language determines the language of text-to-speech prompts, system default prompts, and messages in auto attendant. If you choose a language other than the default selected for the site, you must create and save your audio prompts in the new language; otherwise, no prompt is presented. Can I change the auto attendant language at any time? Yes you can. You can change the language without any restrictions. How do I add a lunch break? You can add lunch hours for your business during regular business hours, exception days, and holidays, by going to Home > Schedules then click to create or edit a schedule. See how to add a lunch hour for instructions. How do I create a prompt using my voice? Scroll down to Call Handling Menus, and click Select an Audio File. Select by calling on phone to record. The system calls your extension or your desired number, and prompts you to record new audio. Provide a name for this new audio file, so that you can easily locate it when needed. You must have Virtual Office services assigned, and be currently logged in as a user. How do I delete or edit an auto attendant? To edit an auto attendant, go to Home > Auto Attendants and click next to the desired auto attendant. To delete an auto attendant, go to Home > Auto Attendants and click next to the desired auto attendant. How do I edit a schedule? From the main menu in Configuration Manager, go to Home > Auto Attendants. While editing the desired auto attendant, scroll down to Business Hours, and next to Select a schedule, click Edit. Make your changes, and Save. How do I delete the audio file that I have selected for auto attendant? While editing an auto attendant, go to Call Handling Menus and click Change file. Click next to the audio file that you like to delete. If you do not choose another audio file before deleting the currently selected audio file, the default audio file will be selected. The audio files repository is also accessible from Users, Call Queues, and Ring Groups edit pages.